Making IMO is a bit of a process. First, you collect the IMO. This is called IMO 1. Then you preserve the IMO 1 to make IMO 2. Then you take IMO 2 to make IMO 3 and then finally you use IMO 2 and IMO3 to make IMO 4, which is the final product that you use. Fill wooden container 2/3 full with cooked rice and tightly cover with breathable cloth. 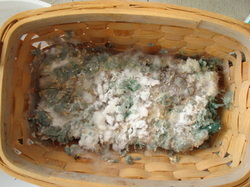 Use some string to secure the cloth around the opening of the wooden container. Find a place where IMO's are already present and growing. Some places to look are the leaf litter in a forest floor or in hot alpaca manure, compost, or a freshly cut wood chip pile. 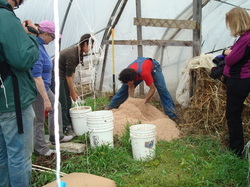 Bury rice filled box in compost, leaf mulch, or wood chip pile. Keep protected from rain, animals. Final product is white, moist, fluffy hyphae of IMO 1. Smells sweet, fermented grain. 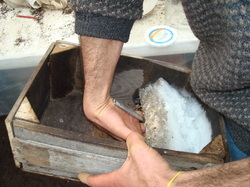 Some darker colored anaerobic microbes may be present. They are okay as long as white aerobic are in the majority. Aaron just pulled out this wooden box that had been buried in the pile of alpaca manure at his feet for 4 days and collecting IMO. You can also see, by his feet, the white cloth and string that was covering the box and protecting the IMO while it was buried. 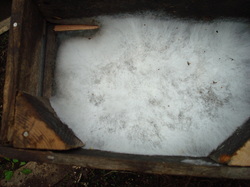 Pile of steaming hot alpaca manure. You can somewhat see that it already has grey chunks of IMO growing on it. This would be what you are looking to capture for your IMO 1. Here is a picture of what Aaron's IMO 1 looked like from the workshop he gave. Full of fluffy white filamentous mychorrizal hyphae! Beautiful! Here was my first attempt at capturing IMO 1. You can see it is far from perfect in that is has a fair amount of green colored anaerobic bacteria in it. I think this happened because of two reasons. I actually got a 5 gallon bucket of fresh cut pine chips from a friend and just buried the container in the bucket containing the chips. I do not do this anymore and would not recommend it. 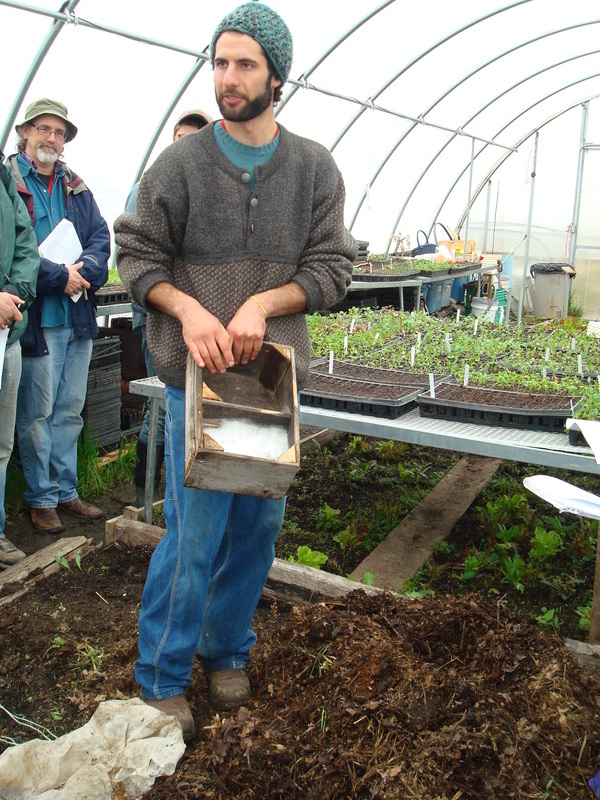 I think it is important to make sure that the wood chips are in contact with the ground and not surrounded by a plastic container, which greatly limits air flow and the ability of your lands native microbes to colonize. The second reason is that I kind of forgot about it and let it sit there for more than two weeks. That being said, even though it was not perfect, it still worked fairly well, so don't be so concerned about getting it perfectly white and fluffy. Mix equal parts of IMO 1 and brown sugar in a large mixing bowl. Fill up the jar (clay is best, glass or heavy plastic is ok) 2/3 full with mixture. You want some air at the top. Cover with breathable cloth and secure with rubber band. Leave in the dark at about 68 F.
Let sit for 7 days. It will become a gruel like texture. It will remain stable and alive in this state for several months, years. IMO 2 is your starter stock that will be used to make IMO 3. 1 Tbs of IMO 2 will inoculate 50 lbs of wheat bran, so a little is all that is needed. Aaron taking out the IMO 1 to mix it with brown sugar to make IMO 2. You can see what's left of the rice substrate that the IMO has grown all over. 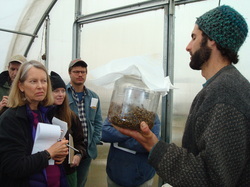 Aaron holding the jar containing the freshly mixed IMO 1 plus brown sugar from the workshop. 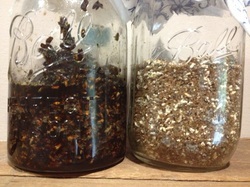 On the Left is my first attempt at IMO 2. Yes, this was made from the IMO 1 above with all the green crud! It turned into the dark brown gruel like substance just like it was supposed to do. On the Right, you see a failed attempt at IMO 2 actually from an even much more neglected IMO 1 that I made earlier this year. I started off with a great IMO 1 from burying in a big pile of wood chips on the ground, but I took the basket out and uncovered it and kept it in my cold garage for several more weeks before I got around to mixing it with brown sugar and by that time it had pretty much died. That is why it never turned into a gruel - it was no longer alive and could not ferment. So, as you can see, I have made many mistakes! Learn from my mistakes and make a few of your own too! Above all, have fun; it will all work out! If you don't have FAA or FPJ made, you can still make IMO 3 with just OHN and BRV. Make an area protected from rain, but on natural ground. Pour wheat bran into pile on ground. In bucket mix approximately 5 gallons of non-chlorinated water, 1Tbs IMO 2, 1/2 Tbs OHN, 1/2 Tbs FAA, 1 Tbs BRV and 1 Tbs FPJ. If your water is chlorinated, simply fill up the bucket at least 24 hours in advance and set it outside so that the chlorine can off-gas from the water. Chlorine will kill IMOs. Mix 5 gallons liquid ingredients per 50# bran or until about 65-70% moisture content. The bran should feel moist, but not completely saturated. Take a handfull and squeeze in your hand and it should crumble when you open your hand. Mix liquid into bran evenly and leave in a pile 18" tall. Cover with breathable material (straw mats are best, but I have used sheets of cardboard, which work fine as well). Use tarp is cold. In 1-3 days, bran will heat up as microbes feed and reproduce. 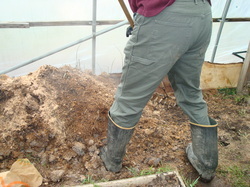 Turn pile once hot ~ 140 F.
You can also add HOT manure to speed fermentation, but this is not necessary. Continue to turn bran until fully fermented, entire pile becomes clumpy and greyish white. I don't know how well you can see this, but this pile is steaming hot in the middle! As it is being turned, steam is being released. Making IMO 3. Pile of wheat bran dumped on the ground. Making a hole in the center in which to dump about half of the 5-gallon bucket of dechlorinated water, OHN, BRV, FAA and FPJ. It takes some effort to hand mix the pile so that it is sufficiently moist. After mixing in the first half of the water, keep adding more whilst mixing it in until all the bran it is well moistened. 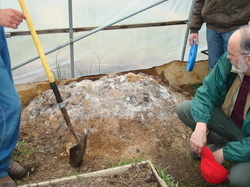 Make the pile about 18" tall so that it will start to generate a lot of heat. You'll then want to cover the pile with some sort of breathable materials. 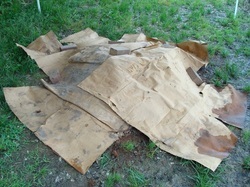 Here is a pile I made and covered with pieces of cardboard. Straw mats also work well. I have a pop-up tent over the pile as well, to keep it protected from rain. 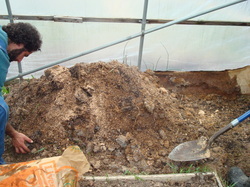 In the picture above, the pile was made in a hoophouse, which also protects it from rain. This is a pile of IMO 3 after a few days. The temperature starts to heat up and you can see the IMO growing all over the bran. Finishing up turning the pile. To make your own sea salt, mix 1 oz (~2 Tbs) sea salt with 32 oz H2O, which will give you about 3.12% salinity. Natural sea water has about 3.5% salinity. Then use 22 oz of this mixture for each 5 gallon bucket. If you don't have FAA or FPJ made, you can still make IMO 4 with just OHN and BRV. Mix IMO 3 with equal parts topsoil. 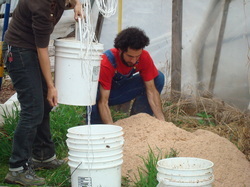 You can also use a 2:1:1 mixture of IMO3:topsoil:compost. 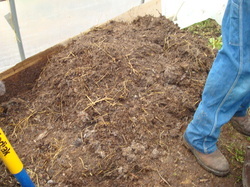 I have also used equal parts of IMO 3 and just finished compost, but make sure the compost is finished. Cover with breathable material (straw mats are best). Use tarp if cold. Continue to turn until IMO 4 has fully fermented and pile has cooled down. IMO 4 is a stable product and has many uses. It should be stored in contact with the ground, but protected from rain.